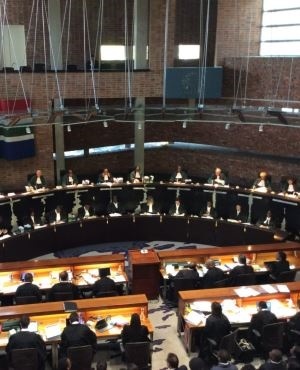 The Constitutional Court is expected to rule on Friday on the application brought by the Economic Freedom Fighters and other political parties around impeachment proceedings against President Jacob Zuma. "We are expecting the full judgment tomorrow," said Eric Mabuza, the attorney for the EFF, UDM and Cope in the matter. The court sent out a statement on Twitter on Thursday afternoon saying that it will make a judgment at 10am tomorrow regarding the question of whether "the National Assembly failed to put in place mechanisms to hold the President accountable"
The application was brought to the highest court in the land in February this year just before the annual State of the Nation address. Mabuza said they were informed on Thursday morning that the court would be sitting. The court reserved judgment on the matter in September after seven hours of arguments. The opposition parties told the ConCourt that they wanted the establishment of a fact-finding ad hoc committee that would force Zuma to answer questions about his conduct during the Nkandla debacle. The parties strongly felt that no action had been taken against Zuma after the Constitutional Court ruling in March 2016 which found that Zuma had failed to uphold, defend and respect the Constitution. The Constitution confers on the National Assembly the power to not only elect presidents but also remove them from office. It does so through either Section 89 (removal of President (or impeachment)) or Section 102 (motions of no confidence). Section 89 of the Constitution states that a president can be removed with a two-thirds majority vote in Parliament on three possible grounds: a serious violation of the Constitution or the law; serious misconduct; or inability to perform functions of the office. If this motion is passed Zuma cannot receive the usual benefits of the presidency and cannot serve in any public office afterwards. Section 102 has been used numerous times to no effect by opposition parties in the National Assembly. The requirement here is that only a majority vote is needed to force the president and his Cabinet to resign. This has never happened, considering that the ANC still holds just over 62% of the seats in Parliament.